Painting the roof of a house is something that is not done by default with any house that is built but it is slowly becoming more and more popular these days. There are different approaches when it comes to painting the roof of a house, and it will all depend on what kind of roofing your house has. Know how to paint your roof and how to safely do it. The first and foremost concern should be knowing how to secure yourself in order to have the peace of mind you will need to paint your roof with ease. Make sure to use a sturdy extension ladder that extends by at least 3 feet above the edge of your roof. Either buy one for long term use or rent from your local hardware store. Make sure the ladder is on even ground and consider getting a fiberglass ladder in order to avoid possible electrocution from unseen live wires lying around. Install roof brackets. What for? Well roof brackets serve a dual purpose. One, they provide you with a safe and secure place to rest your tools and materials and even a safe place to step around your roof as you navigate your way around and they serve as a slide guard if and when you fall and slip when you’re higher up on your roof. Roof Safety Harness. One might question the need for a roof harness if you already have roof brackets installed. Well there is nothing wrong with being too safe. Ask around your hardware store, a roof safety harness is not just a harness but it’s a system consisting of a harness, a pulley, and roof anchor. Before anything else, make sure your roof is clean in order to avoid uneven surfaces when you finish painting. 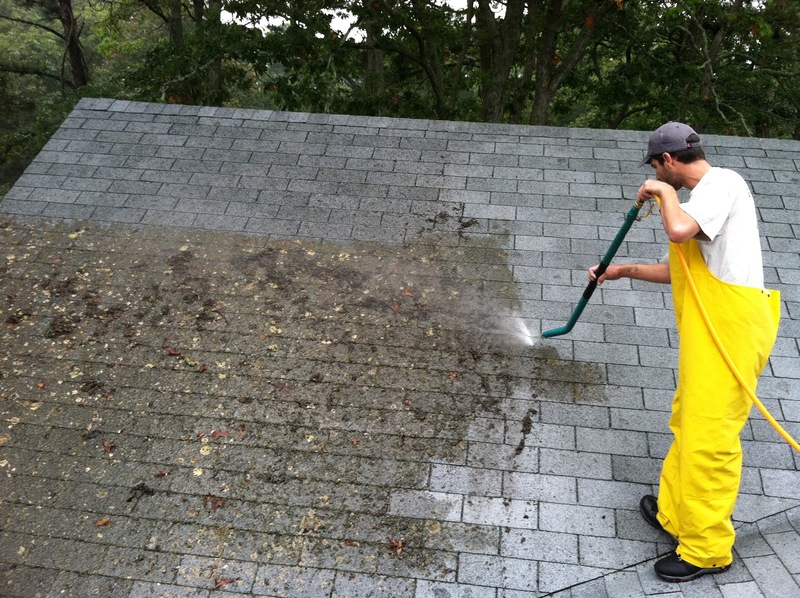 The best and most practical way is to use a high pressure water blaster especially any roof with a rough surface. There are a number of choices when it comes to roof paints. Generally, you would want a weather resistant paint that will last through the harsh and constantly changing weather conditions that your home will be going through. Water based roof paints. This is usually the go to paint type for cement tiled and/or shingled roofs. Although, if you are someone who collects rain water for drinking, water based paints are not usually safe and can influence the water you collect, better do some research before moving forward. Oil Based roof paints. If water based paints are the go to for tiled and shingled roofs although they are safe for drinking water, they do not play well with cement tiles. Oil based paints will help keep the rust away from iron roofs but better make sure that the rust is treated first before applying any paint. A good paint investment would to get heat resistant paint for that extra endurance. Better ask for that specifically when looking for paint. Check the weather forecast. Make sure that it will not be windy, that it will rain and if it is going to be hot, then make sure to start early. If you’re going to rent an airless spray gun, make sure that it is not windy. When all else fails, better higher a trusted tradesman in your area for that peace of mind and quality that no one can top. Find the best painter for your roof here today.